Philips Avent Straw Cup 10oz is the ideal choice for the growing, active toddler. This dentist recommended cup was developed alongside experts in order to make it the best straw cup possible and one that allows for healthy oral development. The cup's contoured shape and anti-slip texture grips make it easy for little hands to hold the cup. The 10oz cup is the perfect size to keep your child hydrated throughout the day and through active times. Few parts - easy to assemble and clean (dishwasher safe): Philips Avent Bendy straw cup can be easily assembled and disassembled. All parts are completely dishwasher safe, for your convenience. BPA free materials: Philips Avent Bendy straw cup is made from completely BPA free materials. 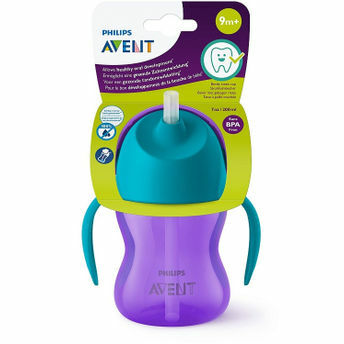 Compatible with Philips Avent bottles and cups: All Philips Avent bottles and cups are compatible excluding the glass bottles and the Grown-up cups. So you can mix and match to create the perfect cup, suiting your toddler's individual development needs. Healthy oral development: Philips Avent Bendy straw cup allows healthy oral development and exercises mouth muscles, building oral strength. Developed with experts to make it our best straw cup possible. Ergonomic handles and soft straw - ideal for young toddlers: The cup's integrated handles are ergonomically designed, making it easy for little hands to hold the cup. The soft flexible straw is gentle on gums while the cup's lightweight small size is ideal for first straw sips.